This guide contains skillet ravioli recipes. 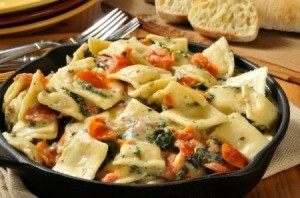 The filling of a ravioli is a great enhancement to a skillet meal. Ravioli skillet recipes are easy to make and full of flavor. In a large skillet, cook the beef, green pepper and prosciutto over medium heat until meat is no longer pink; drain. Stir in spaghetti sauce and water; bring to a boil. Add ravioli. Reduce heat; cover and simmer for 7 to 9 minutes or until ravioli is tender, stirring once. Sprinkle with cheese. Simmer, uncovered, 1 to 2 minutes longer or until cheese is melted. Prepare ravioli as label directs; drain. Meanwhile, cut eggplant and zucchini into 1/4 inch cubes; dice onion. In nonstick skillet over medium high heat, in hot olive or salad oil, cook eggplant and onion until lightly browned, stirring occasionally, about 5 minutes. Stir in zucchini, tomato sauce, sugar, salt and 1 1/2 cup water; heat to boiling. Reduce heat to low; cover and simmer until eggplant and zucchini are tender, about 10 minutes longer, stirring occasionally. Add ravioli to eggplant mixture; heat through. Serve with green salad if you like.